We recommend that you use “naked” bullet loads for the first dozen coated rounds through a new barrel. 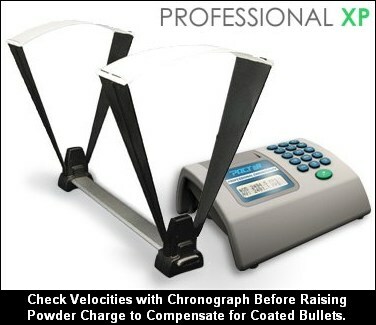 Use a chronograph and monitor velocities. It may take up to 30 rounds before you see a reduction in velocity of 30-50 fps that indicates that your anti-friction coating is fully effective. Share the post "Safety Tip for Loading With Coated Bullets"
When I changed from “conventionally” lubed bullets to polymer-coated ones in my old S&W Model 52 wadcutter wonder, without changing the propellant load, I learned an interesting lesson. The gun fouled up so badly with un-burnt powder that it basically stopped in the middle of a 90 round match. The coated bullets were starting to move forward VERY early, probably on ignition of the primer. This, of course greatly expanded the volume in which the minuscule amount of powder was burning AND decreased the starting pressure to the point that ignition could not be sustained. NOT more powder, but a slightly FASTER one AND a slightly deeper roll-crimp at the front of the case. Eventually off-loaded it and bought a 1911. Shooting 12+ coated bullets to ‘season’ the barrel is the hard way to go. There is a better, quicker way I have been using for over 25 years with success. Take a Parker Hale jag (J.Dewey) and wrap a cotton patch to get an extra tight bore fit and force it through a CLEAN bore first using only BC Gun Scrubber. Repeat, if it not TIGHT. Next, saturate the jag with a 30/70 solution of moly powder and Shooter’s Choice #7, swab the bore with it, and shoot a coated bullet. One is all it takes and the bore is ‘seasoned’ with moly. CAUTION: This method is time critical, you have to quickly shake, coat, swab, and shoot without ANY delay. 1)Make sure the the solution is thoroughly shaken, not stirred. 2)Saturate the patch and immediately start swabbing back-and-forth 4-5 times. Don’t let the swab exit the muzzle or you will not be able to pull it back. 3)Clean out the chamber, then load and shoot the coated round, PRONTO!. That round should be within arms reach. The idea is not to let the solution ‘puddle’. Like I said, I’ve been doing the above for years. And if I follow my directions to the letter, there will not be any problems. Take a Parker Hale jag (J.Dewey) and wrap a cotton patch to get an extra tight bore fit and force it through a CLEAN bore first using only BC Gun Scrubber. Repeat, if it’s not TIGHT. Next, saturate the jag with a 30/70 solution of moly powder and Shooter’s Choice #7, swab the bore with it, and shoot a coated bullet. One is all it takes and the bore is ‘seasoned’ with moly. CAUTION: This method is time critical, you have to quickly shake, saturate, swab, and shoot without ANY delay.